As we move into renewal, how are you getting along with 2019? I don’t know about yours, but mine, and that for team MFML has started with quite a bang. How are you getting along with 2019? I don’t know about yours, but mine, and that for team MFML has started with quite a bang. I think that in the first few weeks of January, it’s easy to get carried away with good intentions. But by the end of January, they can seem like a distant memory. Perhaps your resolutions weren’t what you thought they should be, but they’ve perhaps sparked new ideas for new ways of doing things, new ways of moving forward into 2019? 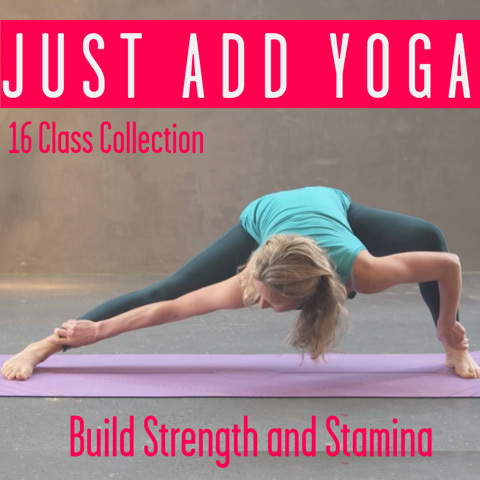 I know a few of you are doing our fabulous Vinyasa 30-day challenge, and some our Just Add Yoga no-nonsense challenge. How’s that going? Join in the conversation on the Movers group to let us know! Well 2019 has a theme for me and MFML about finding how to live a healthy and sustainable life. One of the things about having a sustainable life, is that it’s not just about sustainability of the planet, although clearly that’s more than important! But it’s also about having a sustainable life for ourselves and our families. If you asked the question, how could you make your lifestyle more sustainable for yourself? What changes might you make? These changes aren’t the big ones, it’s not always about booking the holiday of a lifetime but about making the five minute daily meditation practices happen. Perhaps just rolling out your mat before you go to bed makes a big change? Or doing five minutes ready to sleep practice before bed? Or maybe starting the day with a instead of jumping out of bed? Those big intentions you had at the beginning of January? Well perhaps they sparked the idea for how you could incorporate these big intentions into tiny, daily habits. For those of us who did the Cellular Renewal Challenge, was there something in the challenge that you thought, yes, I could do this as a daily, or weekly practice? For me, it’s the sauerkraut recipe and eating more fermented foods. But thinking on sustainability has made me think about the way I run MFML too. I’ve been working away on this, my baby, for now over 5 years and in that time I’ve answered every single customer request and email. But if we are to make MFML the long-term sustainable project which it is now. If I’m here to helm the ship in new, exciting waters and take MFML to be the biggest, brightest version of itself; making improvements to the site, taking us all into new territory, finding out new practices, new ways of being so that we can all learn how to be healthy and sustainable, I’m going to have to do a big thing. That big thing is I’m no longer going to be responding to all my lovely Movers myself. I know. I’ll miss you!! I honestly love chatting, I love interacting with you all. I love your ideas, and hearing your thoughts. Sure, I’ll make sure I do a couple of days a week of checking in with what you’re saying. But in order to grow, in order to be sustainable, we sometimes need to let go of the things we love. Think of the trees – in winter they shed their leaves so that in springtime they can flower and show their new shoots. So it’s with so much sadness, but even more happiness, I’m welcoming Jodie to the team!! YAY go Jodie!! I’m thrilled you’re here to make the whole team run smoothly. I’m not the best at organisation, so I’m hoping she’ll keep me in check too!! She’ll be contactable on support@movementformodernlife.com if you’d like to wish her high fives and hugs for starting out and welcoming her (and make her life at MFML sustainable too!). Perhaps there’s something that you need do stop doing in order to clear out and bring in the new? What is it that you could do to make your life more sustainable? Before springtime and after the first excitement of January is the perfect time to think about keeping daily life sustainable and healthy, and the habits we need to entrench now the excitement of the New year is over. One more super-exciting thing to let you know about – in our year of living healthily and sustainably, we’ll be helping you to find sustainable ways to practice each and every day. You’ve asked for a loyalty scheme and it’s coming up!!! Watch this space!! But in the meantime, we’re delighted to let you know about some amazing discounts from our partners at Asquith and Yoga Explorers especially for you guys! In future, we’ll be rolling out special discounts only to our most treasured and loyal Movers as a little YAY for rolling out your mats with MFML every day. So watch this space! !